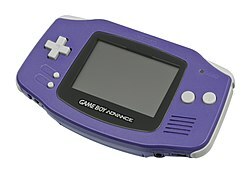 The Game Boy Advance was released in Japan on 21 March 2001. Nintendo later released it in North America on 11 June 2001 and in Europe on 22 June 2001. The Game Boy Advance SP is one of the two Game Boy Advance variations, first released in Japan in February 2003 and later released in North America and Europe in March 2003. It is similar to the original, but it has a "clamshell" design, meaning that it can be folded to open and close. The Game Boy Advance SP has a rechargeable battery, and it does not run on two AA batteries. The Game Boy Advance SP has a backlit screen, meaning it has a bright screen (older versions of the GBA SP have a frontlit screen). ↑ Fielder, Lauren (May 16, 2001). "E3 2001: Nintendo unleashes GameCube software, a new Miyamoto game, and more". GameSpot. Retrieved July 19, 2014. ↑ "Game Boy Advance: It's Finally Unveiled". IGN. August 23, 2000. Retrieved July 19, 2014. ↑ Bramwell, Tom (March 21, 2001). "GBA Day: June 22nd". Eurogamer. Retrieved July 19, 2014. ↑ 4.0 4.1 "Consolidated Sales Transition by Region" (PDF). Nintendo. Archived from the original (PDF) on May 1, 2016. Retrieved November 18, 2016. ↑ "Technical data". Nintendo of Europe GmbH. ↑ Rose, Mike (October 15, 2013). "Pokemon X & Y sell 4M copies in first weekend". Gamasutra. Think Services. Retrieved July 19, 2014. ↑ Umezu, Sugino & Konno. Interview: Transcript with Satoru Iwata. Nintendo 3DS (Volume 3 – Nintendo 3DS Hardware Concept). Assessed on March 7, 2011. ↑ Nintendo Game Boy Micro review". cNetUK. Retrieved on 08-20-09. This page was last changed on 20 March 2019, at 18:18.